Last weekend, we had a very nice time of ministry at Roche Mulatre, which is located up lake Peligre about 5 miles from the dam. 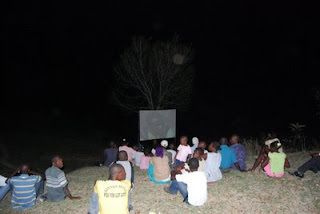 We showed films both Friday and Saturday nights, with as many as 500 in attendance the second night. We traveled to this site by boat. In the past we traveled by dug out log, but this year my friend Jimmie took us up there in his motor boat. We had a lot of fun, and a wonderful time of ministry.